The December cumulative update that was released on the 18th of December 2008 has been re-released. There were many reports amongst the community of errors involved during the update. I myself ran into the old 'Upgrade failed to initialize' error that ocured after running the SharePoint Products and Technologies Configuration Wizard. Lucky I ran this update in a test environment first. Microsoft have also stated that it is recommended to wait till SharePoint SP2 which will be released early next year. I found the Cumulative Update a good option if you haven't installed the infrastructure update yet, as this update includes the infrastructure update. As always make sure you have installed Service pack 1 for WSS 3.0 and MOSS 2007 (if you are running MOSS 2007). Finally. PDF iFilter 64bit. Tested and Working. Well it has been a long time coming, but Adobe Labs have finally released a 64bit version of the PDF iFilter. With 64bit Server architecture becoming more and more common, this is clearly essential for your Microsoft Office SharePoint Server 2007 Search. Configuring Adobe PDF iFilter 9 for 64-bit platforms for MS SharePoint 2007 Note: The steps mentioned below are as per suggested by Microsoft. Please refer to links below for appropriate Microsoft KB articles. 1. Install Adobe PDF iFilter 9 for 64-bit platforms. 2. Verify that PDF has been added to the registry. a. Run Regedit by browsing to c:\Windows\system32\regedt32.exe and double-clicking it. c. If PDF extension is present, skip to Step 3 . If PDF extension is not present, continue with Step d.
3. Verify that PDF has the correct settings in a second registry location. b. Verify the following values. If values are not as shown, edit them. 4. Verify that PDF has the correct settings in a third registry location. Note: Step 4 & 5 are done in order to have the pdf icon in SharePoint while it displays the search results. 7. 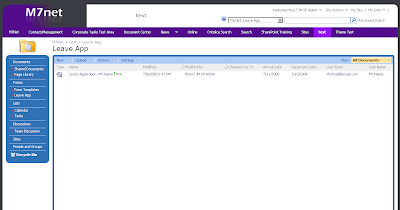 Restart all SharePoint services as well as IIS. a. Launch the DOS Shell (Start > All Programs > Accessories > Command Prompt). b. Type the following at the prompt: “net stop osearch”. Wait for success message. 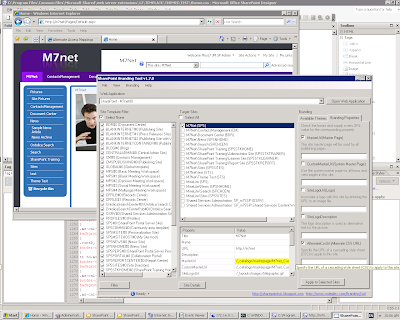 c. Type the following at the prompt: “net start osearch”. Wait for success message. d. Type the following at the prompt: “iisreset”. Wait for success message. These above instructions can be found here. I currently have this working on a production environment as opposed to installing the Foxit 64bit PDF ifilter. Nice work Adobe. SharePoint Infrastructure Update Broke my Search... Twice! It appears that the Windows SharePoint Services 3.0 Infrastructure Update and Microsoft Office SharePoint Server 2007 Infrastructure Update, which can be found announced here, has broken my search on two seperate occasions in two different environment, one being a multi server farm (2 web front ends, one application server, seperate SQL), one being a Single Server farm (which hosts SQL) and even a UAT environment which lives on two servers. The start address cannot be crawled. Access is denied. Check that the Default Content Access Account has access to this content, or add a crawl rule to crawl this content. This is strange because I did a test crawl before applying the update and it works fine. Checking the crawl logs states that my account domain\sp_content is infact throwing an access denied error. Oh the frustration! Basically you have to disable the loopback check, this is done in the registry of your index/ssp server. Open up RegEdit by clicking Start, click Run, type regedit, and then click OK. This should now fix your issue! Bit late on this one, as I thought I already had blogged this. A big bonus for us SharePoint people who love to use virtual environments. 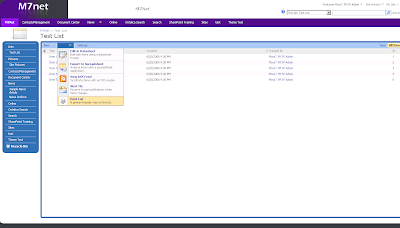 SharePoint is now fully supported in virtual environments! Go Hyper-V Go! A lot of the time when clients cannot afford SQL 2005 standard, SharePoint usually gets installed as a single server farm with an Windows Internal Database. The windows internal database is actually a version of SQL 2005 Express edition. It is actually preferable to use this internal database over a copy of SQL 2005 Express edition because you are not limited to 4gb with the internal database, as you would be if you used an external SQL 2005 Express instance. 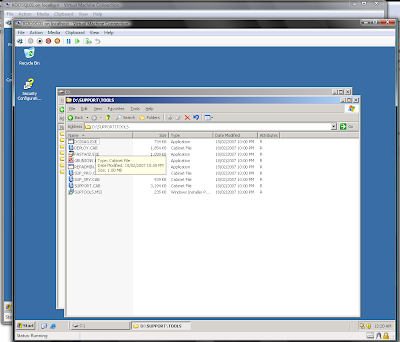 This will enable you to see the databases used inside the windows internal database. This is exactly the same as if you were using a standard version of SQL. Hello World! I haven't posted in a while for one very good reason. I have been on Holiday in the USA and my honeymoon in Malaysia. The trip was awesome and my wife and I had a fantastic time. Interviewed my brother in law on the state of SharePoint in the California and was informed that SharePoint was traveling strong in the companies which he deals with. However one thing that did strike me was that most of the implementations there were Vanilla and had no customization whatsoever, which is a bit of a shame because it seems that the businesses are not sculpting the product to their corporate culture and identity. It is still good to see that the product is being used. The other big chunk of news is my relocation from Perth to Brisbane! So I will be conducting my SharePoint career from the East Coast. Until next time! Infopath and SharePoint. My Preferred method. 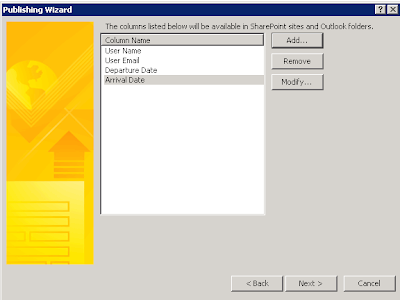 There are many ways to deploy InfoPath forms to SharePoint Server 2007 (enterprise edition) using InfoPath forms services. Over the last year I have had many requests to create InfoPath form solutions to streamline business processes. Conducting research, reading other blogs and general experience has led me to develop a methodology I like to follow when creating forms. This blog post is more about the methodology and reasoning behind the way I like to create InfoPath form Libraries. I wont go into too much detail about how to create InfoPath forms, but more on the best structure to use. 1. First we start with a Site of some sort (this may be a Sub Site). 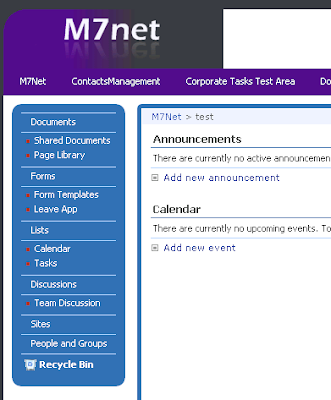 In this instance we are going to create a two Form Libraries (in this case my Subsite is called 'test' which is http://m7net/test). Click on Site Actions > Create (or View all site content > Create) and click on 'Form Library' under Libraries. Give the Form Library a name such as "Forms" or "Form templates" and click Create. Once you have done this we are going to create another form library with the name synonymous to the form you are going to create. The idea of this is to have all of your forms templates in one library and then the submission library (ie: the library where you specify the form to submit to) named as the form you are creating. In this case I am going to create a pseudo leave application request form, so I will create another form library called 'Leave App'. So now you should have two form libraries as can be seen below. You can add a quick launch heading called "Forms" if you like to organize your quick links (as I have done). 2. The next step is to create the InfoPath form itself. Always remember: When creating InfoPath forms it is important to write out and plan the required data sources. Start by creating the data sources you need. 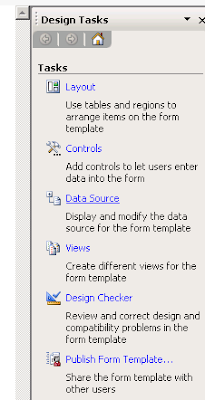 First click on 'Data Source' under the design tasks in the right hand pane. 3. Go Ahead and create the fields you require for your and remember to give them an appropriate name and Type. Also you can check 'cannot be blank'. At this point you may want to also create some 'groups' to group your fields. This is done in the same way you create the fields, except change the 'Type' to be 'Group' instead of 'Field'. So you could have a group called 'LeaveDates' then have two fields as children of that group names 'DepartureDate' and 'ArrivalDate' for example. The best method is to rename the 'myFields' to something more relevant (in this case 'LeaveApplication') and then create sub groups to 'hold' your fields. This is a great way to structure the data and also create 'sections' in your form. Sectioning allows you to create repeating sections and organize your form easier. 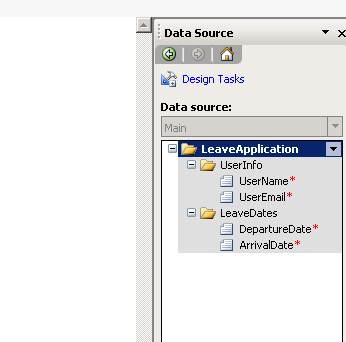 In the example here I have created two sub groups named 'UserInfo' and 'LeaveDates' with fields 'UserName' (Datatype: text string), 'UserEmail' (Datatype: text string), 'DepartureDate' (Datatype: date) and 'ArrivalDate' (Datatype: date) respectively. 4. Right click on each of your groups (Except the top parent group 'LeaveApplication') and click on 'Add Section' this will add sections to your form. 5. Now right click on the fields that you have added and select which type of field input you would like users to use. So right click on the 'UserName' field and click on 'Text Box', also right click on your date fields and click on 'Date Picker' this adds input fields to your form and automatically associates them with your data source. You should have a basic form that looks like this (if you are following this guide like for like). Hint: You can modify the formatting, borders and shading of a section as I have done in the above image. 6. You can add as many sections fields and views as you like, however for the purpose of this blog I will stick to this basic 4 field form. The first thing to do is change the form options to enable this form to be filled out in a browser and also modify the submit options to submit into our 'Leave App' form library. (For an in depth look at changing views on forms check out Andrew Florendine's Blog which has a fantastic posting regarding InfoPath form views). 7. Once you are satisfied with your form click on tools > form options. click on 'Compatibility' and then check the option to 'Design a form template that can be opened in a browser...'. Type in your SharePoint server name here to check for compatibility. Click ok when you are done. 8. Now to tell the form to submit to the other document library. Click Tools > Submit Options. 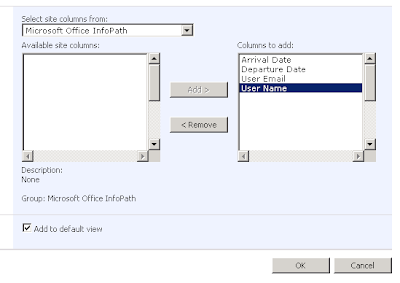 Check 'Allow Users to submit this form', change the drop down to a 'SharePoint document library' and click on 'Add...' to add a new data connection. Enter the document library (http://m7net/test/Leave%20App/ in my case) and also create a concat for the default document name (I have used concat("Leave Application -", UserName) however it would be beneficial to put a date in the concat). Click next and then rename your data connection from 'Main Submit' to 'SharePoint Submit'. 9. Click on File > Publish. If you haven't saved the file yet InfoPath will prompt you to do so. Once you have saved the file to a location, the publish window will come up. 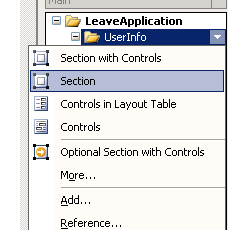 Check the option box 'To a SharePoint server...' click next. Type in your server name and click next. Check 'Enable this form to be filled out in a browser' also check the 'Administrator Approved form template (advanced)' option and click next. Pick a file location and click next (make sure you pick a relevant file location, for instance if your working of c:\development\forms, save the file to c:\development\forms\deployment\_V1 or whatever you like). 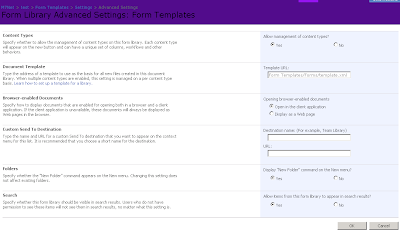 The next screen allows you to promote fields out of your InfoPath form into columns in your SharePoint form library. Go ahead and pick the fields you want to promote and click next. 10. Now the next step is to upload the template and add it to your document library. Open central administrator, click on Applications and under InfoPath Forms Services click on 'Manage form templates'. 11. Click on 'Upload Template' and browse to where you published your form template. Once you have found your form click 'Upload'. 12. Now your form is uploaded, click on the form and click on 'Activate to a Site Collection'. Change 'Activation Location' to your Site Collection and click ok.
13. Now it is time to add your newly uploaded form template to your 'Form Templates' document library. Click on your form template library (in my case 'Form Templates'). Click on 'Library Settings' then click on 'Advanced Settings'. On this new screen click on 'Yes' under 'Allow management of content types?' and click on 'Display as a Web Page' then click on 'Ok'. 14. Click on 'Add from existing site content types'. 15. Select the form you have activated in the previous steps, click on 'add' and then click on 'ok'. 16. Now click on 'Change New Button Order and Default Content Type' just below where you clicked on 'Add from existing content types', uncheck the 'Form' option and click on 'Ok'. 17. Before we can test the form we need to add the columns we have promoted to the form library. 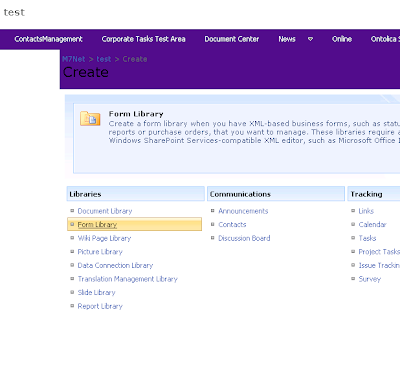 Click on the 'Form Library Settings' and under Columns click on 'Add from Existing Site Columns'. Click on the drop down box and select 'Microsoft InfoPath', this will give you the columns that you have promoted from the fields in your InfoPath form. Select them and click on 'Add' to move them to the right pane. When you are done click ok.
18. 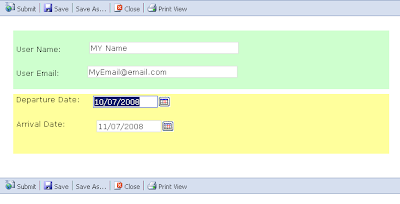 Now go back to your Form Templates form library and create a new form by clicking the 'New' and selecting your form. Please keep in mind that this new form page is linkable by copying the URL in the address bar when you have the form open. This means that you can create links within your SharePoint site that link directly to this form. 19. Once you have submitted the form go to the 'Leave Application' document library (the library where you set the form to submit to) and review the form, notice that the fields have been promoted into the columns. You can now create and modify views to suite which data you would like to expose. 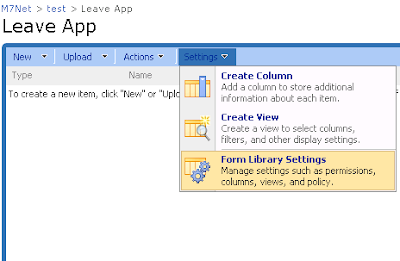 The reason I prefer to use administrator approved templates rather than just publishing the form directly to a library is because if you publish straight to a library and then create a new version of the form and upload it, SharePoint creates duplicate columns promoted form your new form. These columns are then un-deletable and you are stuck with 2 or 3 (if not more) un-deletable columns in your column gallery (which is very annoying). Also the reasoning behind separating your template form library and your submission document library is for security purposes, this allows you to manage the permissions of the submission libraries separate to the template library. This also allows you to keep the templates separate to your form libraries. This in my mind is a cleaner way of doing things, however it is also acceptable to load the templates into their respective submission libraries. I am a bit slow on the uptake as this happened a few days ago, but Hyper-V has been officially released in all it's glory. The reason for my delayed reaction and inability to even test this release is because I am moving my SharePoint and business intelligence ventures to the east coast (Brisbane to be exact). Because of the move my wife's machine slash my virtual server ;) has been boxed up and shipped away as we have moved into my temporary abode. I will post an update once I have upgraded and ran some testing. 1. First Install Windows Server 2003/2008 and get the machine up to scratch (in this instance I use 2003 R2 SP2 64bit enterprise version), after installing the operating system it is a good idea at this time to install any critical windows updates or any other server additions you would like to install. In my case the majority of my servers will be acting in an application role, so at this point I add the application server role to the server. I also take the time to install the .NET framework 3.5. 2. 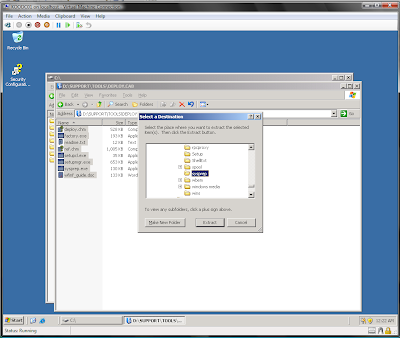 After everything is ready to rumble, insert CD1 of your Windows Server 2003 disc (keep in mind 2008 already has the required tools installed in the system32 directory so you can skip this step). 3. 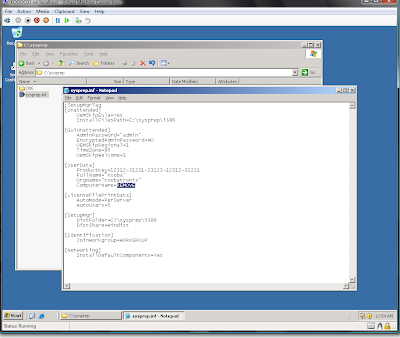 Open the support folder on your Server 03 CD and browse to \SUPPORT\TOOLS\DEPLOY.CAB. 4. Once you have open the CAB file select all of the files inside and right click extract. 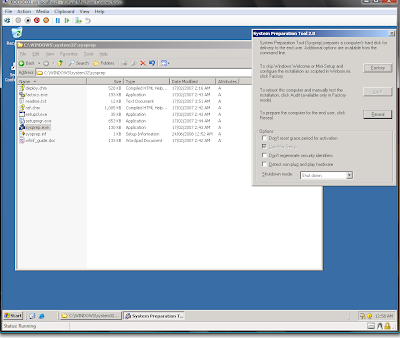 Extract to Windows\System32\Sysprep (mainly for consistency with 2008, however you can extract it to wherever you like). 5. Now browse to the directory and run setupmgr.exe, click next and then next again to create a new answer file for your installation. 6. 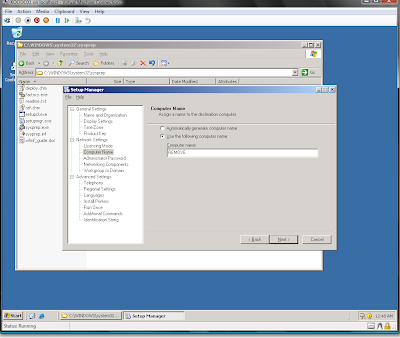 Select Sysprep setup and click next. 7. Select your version of Windows server and click next. 8. Change the option to fully automated setup and click next. 9. The next window will allow you to create the answer file for your installation. Fill out all the detail required except where you enter the computer name type in something like "REMOVE". 10. Continue to click next and fill out the details, under workgroup and domain you may chose to not enter your domain yet (I did this as my first machine was a Domain Controller and I didn't want to clone that VHD as being all DCs). You can add your PC to the domain once you have booted up for the first time. 11. Once you have completed all of the information and saved your answer file close the manager (clicking on cancel will close it, I suspect this is a bug). 12. You will notice that there is now an answer file in your System32\sysprep directory. However the one that Windows actually uses when it boots up for the first time after sysprepping the machine is in the c:\sysprep\ folder. Double click on the answer file and remove the text that says 'REMOVE' this will prompt the automated install to stop at this point to ask you for a computer name, therefore enabling you to be able to rename your virtual servers at the point of initial installation. 13. The final step for the system preparation is to go back into the System32\sysprep directoy and double click on sysprep.exe. Click OK and then click on 'reseal'. This will shutdown the machine. Now the machine is shutdown, grab the VHD and rename it something like: 2003_Template or whatever you like and make as many copies as you want, when you boot the machine up it will automatically run the initial system setup as if it was a fresh machine, prompting you only for the Computer Name. Remember to add your new server to the domain and away you go! Happy virtualizing! 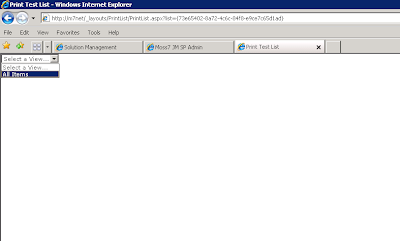 SharePoint List Print View... my oh my! I have spent a lot of hours designing and creating complicated custom lists for clients (usually to replace communal excel spreadsheets). Many, Many times I have been asked by clients: "Jakob, how can I print this fantastic list from SharePoint." Quite often the only realistic option to print a decent view of the list is to export it into excel and then print it from there. However this doesn't really provide a Business Productivity focused approach to printing out lists my any means! To Install Print List, download the .WSP file from Codeplex. Now you will need to activate the feature on the site collection through Site Actions. Changing the Master page CSS and themes across multiple site collections and sites can be a real hassle, unless you change the default master page. 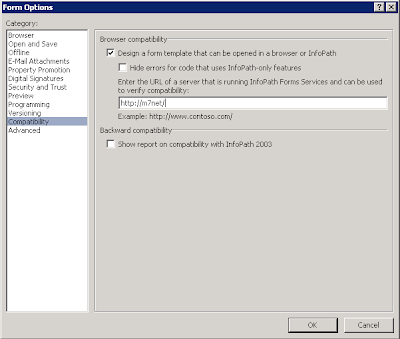 However, you may want to use multiple master page, CSS and theme combinations across your SharePoint deployment. WSS 3.0 also makes it tricky to actually change the masterpage and apply custom CSS. Recently I had to create a custom look and feel for a client which involved creating a custom Master page and Custom CSS. I had implemented WSS 3.0 SP1 and a quick search on codeplex I found the SharePoint Branding Tool. I have to say well done to the creators of this fantastic tool as it allows you to quickly and easily modify which sites use which master page and the excellent thing about it is that it allows you to modify WSS 3.0 implementations. I am sick to death of corporations taking their IT solutions so lightly. I have now attended (once as a trainee and once as a trainer) two training sessions to do with PerformancePoint and SharePoint where the 'higher' level employees of the corporation have sent along general administrative staff eg: secretaries, admin staff, hr staff etc. to conduct high level SharePoint and PerformancePoint administrative tasks. I mean come-on, (no offence) secretaries posing as site owners and dashboard designers? Is this how seriously the CEO's and upper management take this type of technology? I totally disagree with the way that businesses are approaching these technologies and their values to business productivity and business intelligence, yes they are designed to be end user friendly, however having personal assistants and secretaries design business models and content management policies and workflows is ludicrous. Now maybe it is the way that Microsoft is selling it's products but I just felt I really needed to get this off my chest. I know I write my blog posts in a fairly comical manner (I assure you there will be beneficial technical data in there somewhere), however I take my job and passion very seriously and when I see occurances such as the above mentioned it really gets to me. Hopefully when their systems fall over, upper management will see the errors of their ways and employ some real architects, planners, engineers and administrators to properly implement these fantastic products that Microsoft have provided for us. Well I have spent most of today larning Microsoft’s new BI tool: Performance Point Server. It has been overwhelming to say the least, however the trainer has increased my knowledge of the very interesting world of business productivity and business intelligence. I could go on but I think you get the point. Well I hijacked my gorgeous wife’s machine which was running my old e6300 dual core (my ex overclocked cpu) (thanks babe!) whacked in a new mobo and 8gb of ram and thought it would be a sweet idea to Install Server 2008 and build a virtual network! Yay! 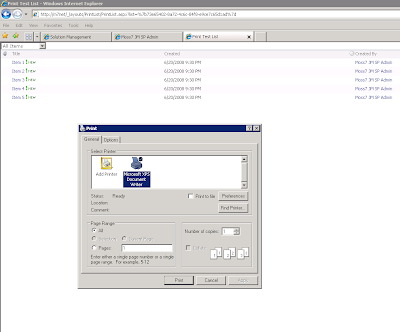 Server 08 - Exchange 07 and Office Communications server. Well I got a lot of configuring ahead of me and so far the machines are all bare and ready to be pounced apon. Well Thanks to my buddy Edin I have migrated from google blospot to here (here was wordpress at bluehost)! woohoo! now all I have to do is some customising, and the site will be looking pretty shmiko in no time. UPDATE: I have come back to blogger. Recently we lost our parking at work. Its not that we couldn't find it, its more like it was taken from us. I decided to take matters into my own hands and purchased a new means of transportation. My new 07' GSR600 Suzuki Motorcycle not only costs me less fuel, it cuts through traffic like a hot katana through cold evil. The parking problem is now solved. I will post pix some time soon. I can't believe that I have been online for this long and never had a blog. Well here it is due to popular demand. I guess I never have seen the point of Blogging except to share my opinion. So here it is: Koobar's Point. P.S. Just to clarify this initially, my nick name is Kooba (Koobar online usually), this is derived from my polish name Kuba <-- Jakob (yakub) = Kuba. Just to get that all out of the way. Enjoy!